Learning At the LRC: It is Banned Books Week this Week? It is Banned Books Week this Week! Many books are banned each year and it has been this way throughout history. What is censorship? Why do people and organisations ban books? Do you agree or disagree with this practice? Does the LRC ban books? 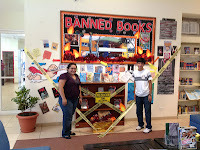 Follow this link if you would like to know more and check out the banned books display in the LRC.